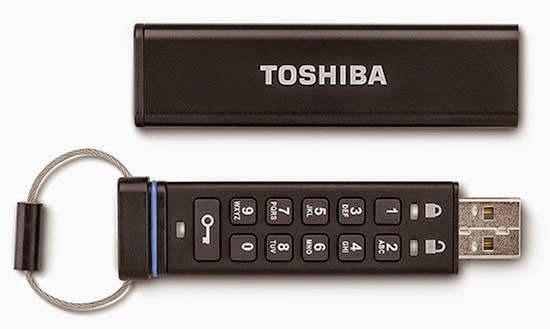 Japanese company "Toshiba" revealed through its branch "Toshiba America" for a new USB characterized as integrates the security aspect in it, the new key "Encrypted USB Flash Drive" and as its name indicates it key will be encrypted and therefore will be characterized by high protection of the data stored in it in addition to the features other. Toshiba unveiled a USB key and basic advantage is that it encrypts the data stored in it when mounted on a computer-enabled encryption AES 256 house, then the user enters a special code "PIN CODE" and by the small keyboard found on the USB and is another feature Toshiba's unique innovation, but in the case of error in entering the correct code to be ten times the data stored destruction. Upon completion of these stages are decrypt these files to be used on the computer normally, and then immediately pull the USB re-encrypt data again, the new USB key available four models and different perfume: 4 GB for $ 95 0.8 GB for $ 112 0.16 GB for $ 140 and finally 32 GB for $ 200.